A truly standout shot - an almost mathematical variety; brilliant crop/framing and use of your subjects to form their own leading line. Superb - good job, Ed. So similar yet so different. I look for that swooping shape a lot but never find it. Someday you must tell me about this "exposure work in Lightroom." Great. I just shot some photos at the beach and now I have to throw them away. I love how you pulled out the simplicity in this busy scene. Typically exquisite. Why I haven't added you to my fav photogs before now I don't know, but doing so now. You inspired my shadows shot, btw. Brilliant photo, severely underrated at 17. Thank you, sir. This is wonderful. Fantastic photo. 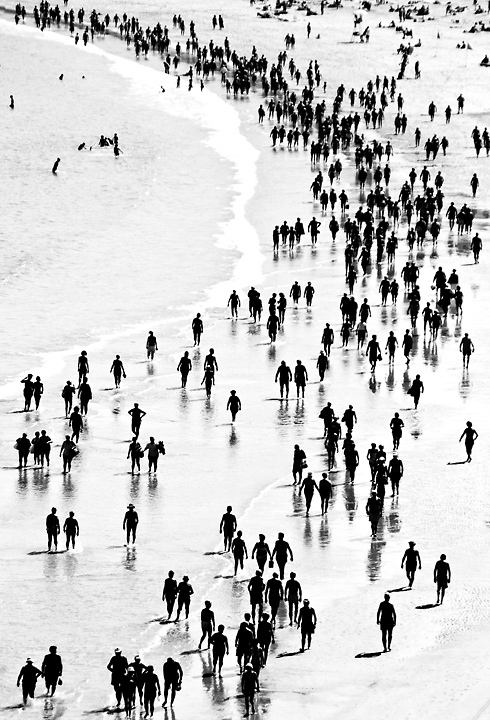 I really like the individuals represented as cyber-dots on the beach ... this ought to be the cover photo of William Gibson's next novel!!!!!!! This is a fun photo for the viewer to take in. The B/W is perfect for this and quite well done. Very nice! Good luck in the challenge. Not something one sees everyday. A breath of fresh air. I'm somewhat bothered by the completely blown highlight along the edge of the water, but I won't let that keep me from giving this fine work 8. I am around half way through voting, and this one stands head an shoulders above the others I have viewed, Superb! Almost look like a painting. Very cool! I love the contrast. Really sets the photo out in my mind. Very nice. A totoally different beach view then what is standard. I like it and hope this does well. 9.
what a perspective! they look like busy ants in a line. im still in awe of this. it reminds me of on of those maps where they plot the population by small human figures. I believe I have also been to that beach, is thay where they have the "tin-tin swim school"? I don't understant the title, but it's a nice abstracty picture. Proudly hosted by Sargasso Networks. Current Server Time: 04/20/2019 12:47:56 AM EDT.